The house we are going to explore today is a real treat. It deftly combines different styles to create an end product that is stylish yet simple. And like any good creative project, the beauty lies in the many architectural details subtly sewn into this one-storey home. 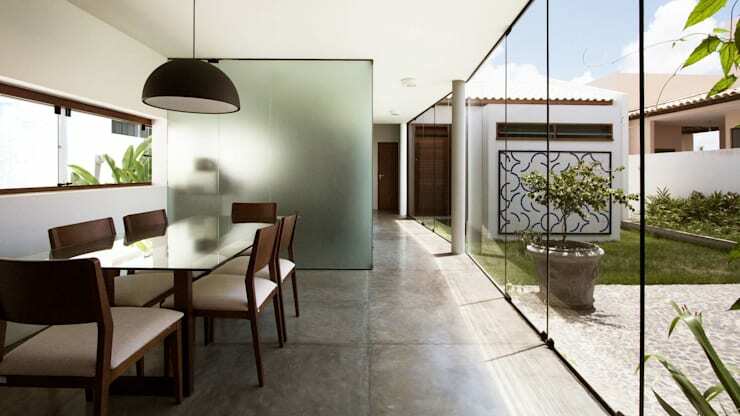 Designed by the Brazilian architecture firm Coletivo De Arquitetos, the Residencia Patia Aruana, as it is called, combines contemporary style with touches of classic design. The house itself does not occupy a lot of square footage, but instead of cramming a lot into a small space, the architects chose to make the space work for them. They simply made practical design decisions and opted for materials such as wood, concrete and glass to utilise the space as much as possible. Aside from the exquisite interiors, what caught our eye here is the way the foliage around the house has been integrated into the overall design; it is accessible from every room of the house and provides much-needed ventilation and light. Definitely a home we'd love to own ourselves! 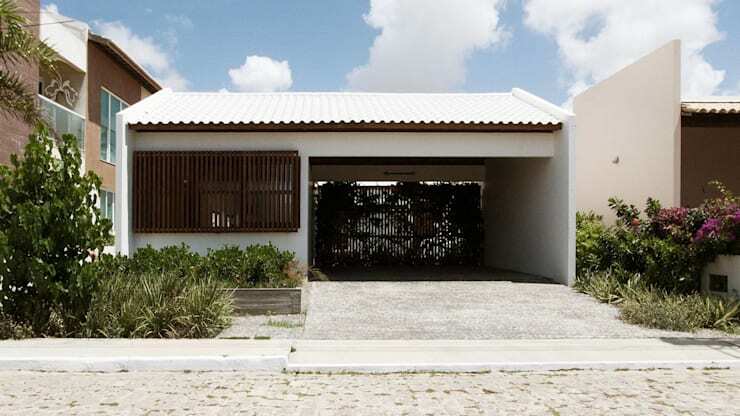 Simple, linear lines define the facade of the Residencia. In paying attention to the small things here, though, the architects have managed to find a deep harmony in simplicity. The unassuming white facade is given oodles of character by a traditional window shutter, which is also a cost-effective way to keep the interiors cool year-round. The concrete pathway leading up to the garage and the white stone pavement come together to create an almost Zen-like effect, a vibe that is alleviated by the lush greenery strategically flanking the house. 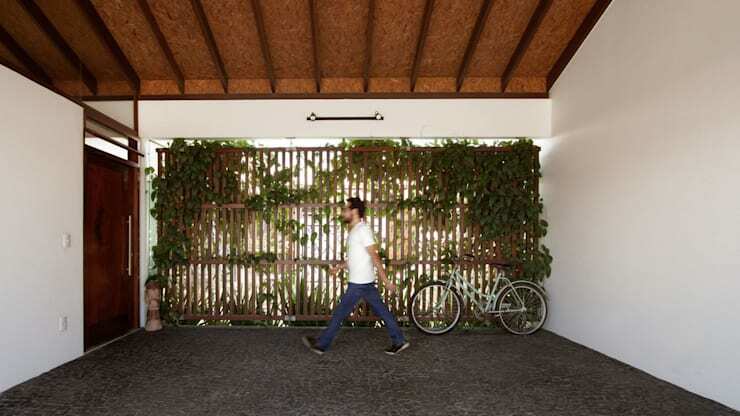 Here's another striking feature of this house: the wooden lattice panels that you will find at one end of the garage adjacent to the entrance. Covered in creepers and vines, it hides the inner courtyard from prying eyes and adds a nice country touch to an otherwise modern home. You just know that a thousand Instagram pictures were born here. You can also take a closer look at the structural details of the house here. Notice the wooden OSB panels on the roof resting on panels made of the same material. This long horizontal opening is actually the window of the kitchen. Once again, small details go a long way in imparting a sense of luxury to the space. You see it here in the old wood framing the glass window. The kitchen in the Residencia is a well-lit, gorgeous area that owes its unique character in part to this window. The plants seen here act as a focal point of the decor when seen from the kitchen, a clever way of bringing the exterior inside. If you're a bit bored of the standard window design, our experts here can give you new ideas. Finally, we come to the interiors. If you're struggling with a small space and wondering what to do with it, take a cue or two from these guys. By opting to invest in high-quality materials, the architects ensured that the limited space would be buoyed up by elegance and style. Not to forget, a smaller space means that the details are placed under a microscope. So, a polished concrete floor for example adds an air of sophistication to a minimally designed dining room. The sandblasted cube on the left hides the bedroom from the communal spaces of the house, while on the right is the inner courtyard. 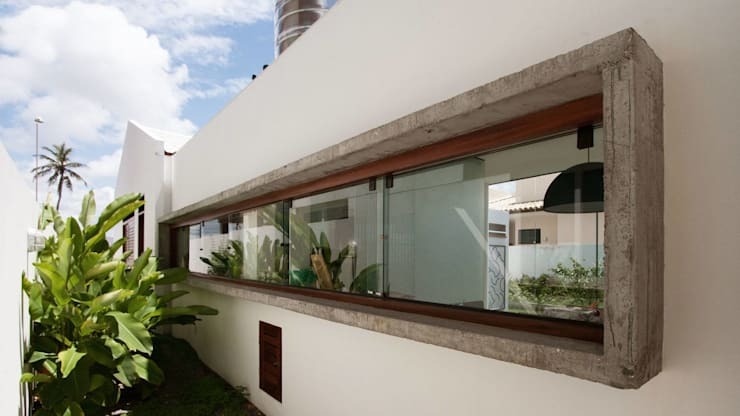 The floor-to-wall windows ensure that the interior flows seamlessly into the exterior. We leave you with this lovely courtyard around which the Residencia is wrapped. Who needs a backyard when you can have your own private enclosed outdoor space! All the rooms in the house overlook this space, which of course means that there is no dearth of light. 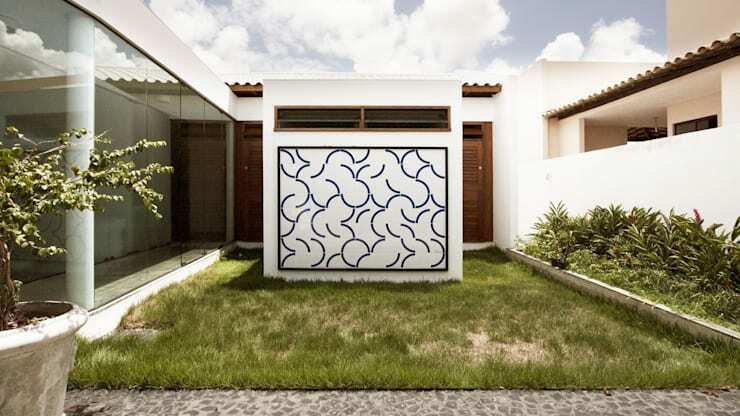 The courtyard here has its own patio where the owners of the house can catch up on some reading or sunbathe in lounge chairs, all while admiring an art installation made out of ceramic tiles. Check out The compact home of simple chic to see another cleverly-designed small space. What did you think of this stylish contemporary home?